The charming Riad Lorsya is a traditional and luxurious Moroccan riad located right in the heart of the ancient and historical medina quarter, within walking distance from a number of the most popular attractions and sights including the famously atmospheric Jemaa El Fna Square where snake charmers and street magicians enchant visitors, the luscious Marrakech Museum, the Bahia Palace and the Palais Des Congres to name but a few. The riad is decorated in a delightful Moroccan fashion and offers a range of facilities for guests to take advantage of including an indoor swimming for guests to use as well as a full-service spa and sauna for those seeking to relax and unwind fully after a busy day sightseeing. There is also a stunning rooftop terrace where guests can soak up the African sun by day and stargaze by night. 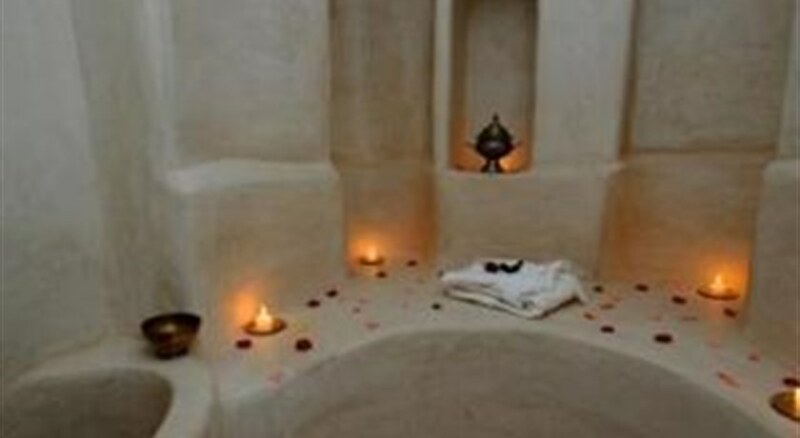 Each of the rooms are decorated in a traditional Moroccan style and feature air-conditioning, phone, free local calls, coffee and tea making facilities, private ensuite, toiletries, in-room safe, welcome amenities, ironing set on request, sofa bed, cookware, Wi-Fi connectivity, private pool, and infant bed. 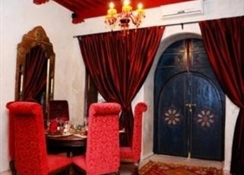 For dining there is a restaurant serving a range of Moroccan and international cuisine for guests to enjoy upon request. There is also a breakfast service offered daily and a cafÃ© for those seeking a lighter refreshment during the day. Additional amenities include parking nearby for those arriving by car, 24-hour front desk, secretarial services for those on business trips, event catering, BBQ grill, grocery store, porter, terrace, childcare, 24-hour room service, audio-visual equipment, banquet facilities, beauty services, business services, cell phone rental, coffee shop, computer rental, concierge, currency exchange, doorman, dry cleaning and laundry service, exhibit space, express check-in, tours and ticket assistance, technology support staff, smoking areas, internet point, library, medical assistance, conference room, multilingual staff, patio, garden, luggage storage, safe, 24-hour business centre, sauna, security guard, TV in lobby, wedding services and translation services. The Lorsya is ideally suited to those seeking a traditional stay right in the city of Marrakech, in a traditional residence offering a true experience of Morocco. There is an indoor swimming pool for guests to use, along with a spa and sauna. Each of the rooms are decorated in a traditional Moroccan style and feature air-conditioning, phone, free local calls, coffee and tea making facilities, private ensuite, toiletries, in-room safe, welcome amenities, ironing set on request, sofa bed, cookware, Wi-Fi connectivity, private pool, and infant bed.. Certain amenities may be payable locally. The hotel features a restaurant serving a range of traditional Moroccan and international cuisine for guests to enjoy upon request. A breakfast service is offered daily and there is room service for guest to enjoy. There is also a cafÃ© for those seeking lighter refreshments.